Wait, before I announce the winner, I'd like to thank all those who entered and left a comment. Mr. McGregor's Daughter: "... It works really well to get the weeds out of the gravel too. I cleared the whole gravel area on the side of my house in two days with it. (No, I'm not slow, there really were that many weeds.)" Teresa-Gardening with Soule: "I also love my cobrahead. I use that the most of all my tools. It does everything. I hope your lucky winner enjoys theirs." Lisa at Greenbow: "... My dear BIL bought me one for my birthday after seeing them at the SF and I was saying how I thought it would be useful. I was right it is very useful." Healing Magic Hands: "I have a cobra head weeder and it is the GREATEST tool I have ever bought on an impulse." Dee from Red Dirt Ramblings: "What a generous offer from Cobra Head. I can attest that they make wonderful tools. I have my own short handled one, and I love it for removing Bermuda grass and other pesky deep-rooted weeds. Someone is going to be very happy." 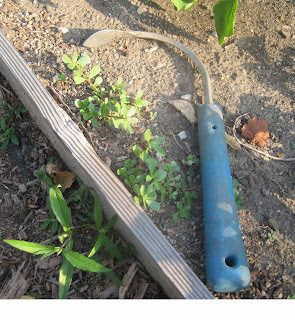 And then there were the comments from so many gardeners on why they wanted their own short-handled Cobrahead weeder, Truly, every gardener has their own weeding issues and the need for a good tool to help them remove them. Yes, that's right! After reading the comments, the wonderful family behind the Cobrahead company sent me an email and said to pick EVERYONE! So, if you left your name in the Mr. Linky widget and I have your email address, you are getting your very own short-handled Cobrahead weeder! Here's how it will work from here. As noted, if your name is in the Mr. Linky widget, I'll send you and Annaliese at Cobrahead an email sometime this weekend. You, the winner, should then reply just to Annaliese to let her know where to ship your short-handled Cobrahead weeder to. If you don't get an email from me by the end of the weekend, please email me at Indygardener at gmail dot com so I can confirm you are on the Mr. Linky widget and I'll get you hooked up. If your email address is not visible on your blog or blogger profile, please send me an email so I can get it. This is truly a generous offer. A BIG thank you to everyone at Cobrahead for a great weeding tool and for making 60 gardeners very happy! "Weeds watch out, the Cobraheads are coming!" Those Cobrahead folks totally rock. Congrats to all your commenters. I didn't comment because I have one (and won another at Spring Fling Chicago), and it's a very useful tool. Holy Cow, that's incredible! I had been procrastinating in getting around to buy one after seeing everyone gush about them at SF. What a generous offer by Cobrahead! Karma to be paid back ten fold, me thinks. That is FANTASTIC news! What a nice company! I can't wait! Holy crap that is the nicest thing ever! And talk about smart publicity ;) I will be telling EVERYONE how awesome the Cobrahead people are! oh that's great! I'm not one of the lucky 60, but I love a generous little company like that. As my wife would say "I'm S. and A." stunned and amazed. Thank you Carol, thank you Cobrahead. SWEET!!! Thanks to you and Cobrahead!! HOLEY KATZ!! That is just the coolest deal! They completely rock! Eeeeee!! Happy Friday dance!! This is the best thing that's happened to me all week! Thanks so much to you and to Cobrahead! Awww... I didn't enter, having won before, but have to say I'm impressed with the way Cobrahead decided to give them to your commenters, Carol. Philo bought his, I won mine, and we gave them as gifts. It's a great garden tool - was using mine yesterday. Unfortunately the task was digging up dead plants, but the Cobrahead made even unpleasant jobs easier. Wow! Cool! You've had an "Oprah" moment. Was it fun? Like DivaGlinda I didn't enter because I prefer to let someone who is more deserving win these kinds of things. But kudos to the Cobrahead people. They are a classy company. Wow! Now that's really cool! Now I know I was here earlier and left a comment. Did your bunny eat it? I am very happy to win a Cobrahead, Thank you Carol, Cobrahead and Annaliese. oh, what a surprise! what generosity :) shall I understand that it will be send to me to Poland as well? Thats really a good news! Many thanks to you and Cobrahead ! Holy Smokes! You and Cobrahead really know how to make a weeding fanatic happy. I am very grateful. The weeds not so much, I see them out there now trembling. friend. Annaliese is a delightful and generous person and I enjoyed meeting her at the Garden Show and then again at Spring Fling. Can't wait to try out my new Cobrahead! What a pleasant surprise. I was just thinking that I hadn't heard from you so probably didn't win, but thought I'd check to see who did win. Wow! How generous of the makers of Cobrahead. They will get a rave review on my blog once I get it and use it. Thank you so much! I nearly fell out of my chair and spilled my coffee!! This is so generous and I can't tell you how excited I am!! OMG - that is awesome. How generous of the Cobrahead people. I'm so excited. Thank you, thank you. That is awesome! And, so generous! Thanks! WOW, WOW, WOW, what a truly generous offer from the folks that make the Cobra head. I've sent you off an email with details. Thanks very much. Having met Anneliese at Spring Fling, I know firsthand what a delightful person she is. But wow, I never expected this! Thank you, Cobrahead family (and yes, it IS a real family behind that company!) and thank you Carol for playing host to another fabulous giveaway. What a great way to run a contest. I can't wait to start using the Cobrahead weeder or to tell all my friends about it. THANK YOU! Very generous of the Cobrahead folks. That's important. The spouse said "You won a what?" Thank you! And what a great way to build goodwill in your target market, Annaliese. I concur with Marie and will spread the word. Thank you thank you Cobrahead! I too, will spread the word. Can't wait to get to work weeding. AWESOME! I even left some of my weeding today in the hopes that I might win. Many thanks to the friendly people at Cobrahead, and to you, Carol, for playing hostess to this great giveaway. Man, that's what I get for going out of town and not keeping up with older posts! It's very cool that Cobrahead is so generous though. I just wanted to thank you once again for the CobraHead weeder and wondered if you, or anyone else thought it reminded you of something a ninja would use?